The PRA method (Participatory Rapid Assessment) is one of the main methods of which the general principles are covered in fact sheet C1. This is a learning process based on good knowledge of the rural environment. 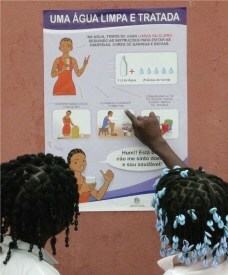 It associates and involves the local populations in searching for the best sustainable practices in hygiene and health. This method has been used since the 1970s, under the impetus in particular of the UNDP (United Nations Development Programme). Providing access to water or sanitation is not enough if the population does not have a minimum understanding of notions in hygiene and do not assimilate the solutions that are found to reach this. The populations involved have to be made interested, educated and made accountable for the stakes concerning the healthy and sustainable management of the hygiene and health problems in relation to water or sanitation. Firstly, all populations that do not have satisfactory access to water and sanitation, without excluding those however that already have access. 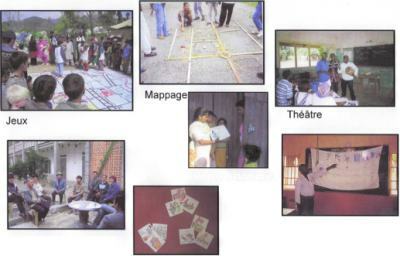 At the outset, programmes such as PHAST were created to assist des community groups (rural villages, small towns, etc. ), as it is easier to involve a limited number of people and members of the same group or community. However, awareness and educational campaigns can also be set up on a wide scale, as is the case for example in the State of Mali. 5) What does this method involve ? How is it used ? 3. sharing knowledge and know-how, meals, experiences, etc. between the outside people intervening and the local populations. 1. "Handing it over" : instead of an outside person having to understand the knowledge of the people, it is the latter who are encouraged to develop their abilities which often are misunderstood. They collect and analyse the data with the assistance of the facilitators and suggest the action to take. 2. "Visualising and sharing" : the people transmit their ideas and their knowledge in a visual manner. In verbal communication, the outside person tends to dominate the dialogue (through gestures, interruptions, etc.) more easily than with communication that uses visual aids. When for example a map is drawn with a stick on the ground, everybody can contribute, and the people have more reassurance than when placed in front of a map drawn by the outside person on a piece of paper with a pen, a symbol of the power of the outside person. Sharing also implicitly implies sharing food and lodging during the PRA. - ranking : the people are asked to compare units (for example families /trees /harvests) and to group them together according to their own criteria. For example, by comparing two-by-two the importance of certain trees, the people discover the criteria that they use to evaluate the utility of the latter. Ranking is also used to stratify the local population, for example ranking via wealth. The results of the ranking and the criteria used provide starting points for discussion. - calendars : the people indicate things that change over time, for example, the month in which they have to borrow money or in which they receive it, the periods when their children became afflicted with malaria or diarrhoea, periods when rain is normally expected, etc. 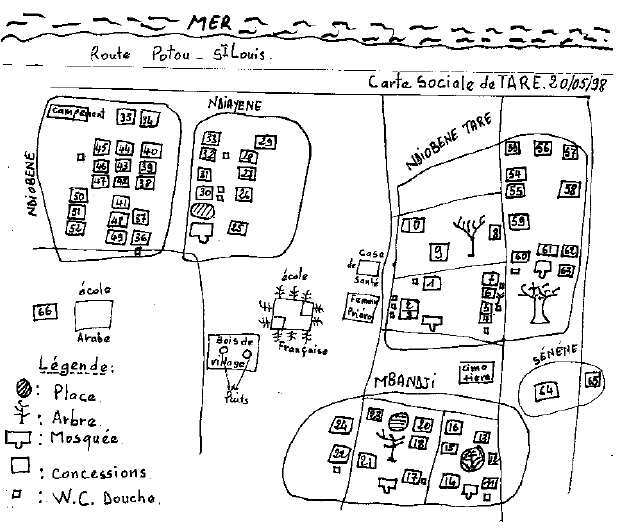 The combination of information obtained using all of the tools provides the villagers with an explicit image of their daily life. Not only does this method help them to initiate a discussion on their main problems and on how to solve them, but the fact that they are able to carry out this analysis themselves also increases confidence that they have in themselves. - The time initially spent by the community is generally from 3 to 7 days. Afterwards, much time is required. If serious consideration is being given for a community to initiate actions based on the PRA, one must be available for at least one or several years in order to facilitate the desired changes, if the community so asks. - A PRA has to be carried out by experienced personnel. The facilitators must be well-trained. As a PRA requires a change in attitude in most of the leaders or in analogous field personnel, a short training period of one week is not enough. 1. the people themselves analyse their situation and plan for the future. Their own values, their own needs and their own priorities are the starting point. Thanks to a better understanding of the situation the plans are more realistic and the people feel much more involved in the scheduled activities. 2. The many different ways of looking at daily reality and viewing provide good opportunities for going beyond the most obvious and predominant viewpoints in the community. 3. The methodology can be modified. Everyone can develop new tools and new ways of organising things. The PRA can therefore be applied to a very vast range of situations. 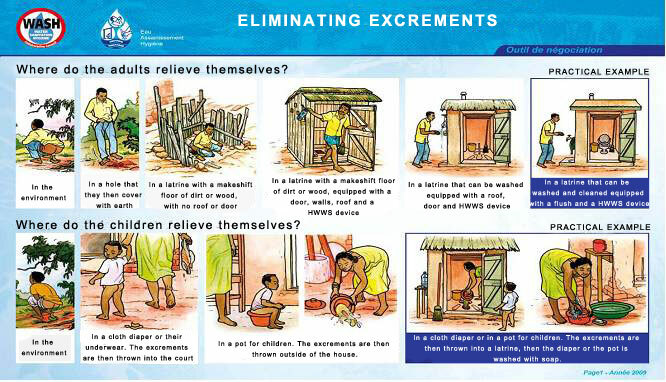 Indeed, it has been used in rural and urban areas, in developing countries and in industrialised countries, in agriculture, in health and in social programmes. 4. This method does not require a lot of money or a lot of equipment. 1. There is some difficulty in defining exactly just what a PRA is and how it has to be implemented. The debate on this issue is a lively one and is not yet resolved. The social scientists who have developed this method are invariably disappointed when they see how PRAs are applied by others. - during the PRA, the team is dominated by outside experts who leave the personnel (local) of project with a report full of good intentions but which has very little practical meaning. Costs can vary substantially according to the country and the situations but a cost of about €1 for two inhabitants can be retained. This cost can become more affordable if grants are obtained or if any revenue can be derived from the measures set up. It is also very important when setting up budgets to take inflation rates into account, as these can be very high in certain developing countries. - A survey on the existing situation : sanitary, technique, economic (then require participation that is in line with the means) and political (know the forces that exist at the local level, in particular the town hall). - A survey on the knowledge of the population, its level of education. - A survey of the ethno-sociological type on the practices, customs and behaviours of the population. Success stories have to be shown and influential people must be invited to see the places where projects have succeeded. 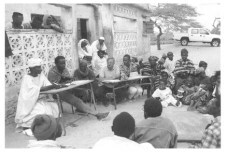 The AQUADEV association used PRA tools between April and October 1998 in Senegal in the region of Louga with 30 villages in the department of Louga and 3 urban sections of Louga and Dahra (department of Linguère). Here are two examples of this, the interview and the social map. - Interviewing is an important PRA tool which makes it possible to obtain a lot of information on the population when it is carried out properly. This information (ethnics, possible conflicts, customs, beliefs, local sanitary experiences, etc.) will be precious when putting the development solutions together. - The social map provides an aerial view of the territory and makes it possible to assess how the land is occupied and how it is represented by the villagers. In addition, it makes it possible to obtain important information on the population of the village (ethnic distribution, number of concessions, etc. ).